Has any operating system been so maligned and so praised during a painfully long development cycle as Windows Vista? The march to Vista's launch has sometimes seemed longer than the Hundred Years War. Now that Windows Vista is at hand, let the debating begin. Is it a look into the future of operating systems, or the last, dying gasp of an old way of computing? Should you upgrade your system to meet its considerable hardware needs? Is it anything other than Mac OS X Lite? 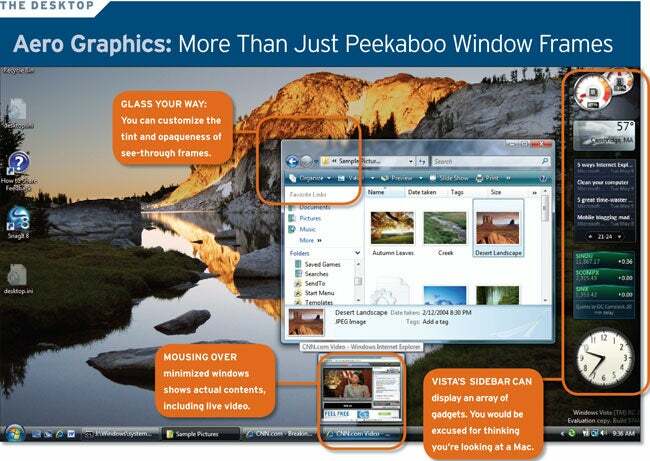 Some may complain that Vista isn't as revolutionary as it should be after five years of work. But you don't judge an OS by the amount of time developers have put into it. You judge it by how useful and how pleasurable it is to work with--and in these respects, Windows Vista is a clear winner. It's beautiful, sports much-improved security, offers superb networking capabilities...and maybe most of all, it's just plain fun to use. That's not to say it's perfect--far from it. Some may view the new interface as little more than fluff or be turned off by the intrusive User Account Control feature. Expect a long-running discourse between Vista lovers and Vista haters. On which side will you fall? There's only one way to find out--by taking a tour of the operating system. For more Vista information, tips, and answers to frequently asked questions, subscribe to PC World's Windows Vista newsletter.